Learn to setup and parse data from the Sensoterra platform to Ubidots IoT App Development Platform. Sensoterra is the low-cost, robust and fully wireless solution to real-time soil moisture measurement for agriculture, horticulture, nature restoration, and landscaping. In this tutorial, we will demonstrate how to integrate Sensoterra’s Soil Moisture probes with Ubidots using the UbiFunction addon. Sensoterra account to have access your probes via API. Soil Moisture probe registered and sending data to your Sensoterra’s account. An active Ubidots account with UbiFunctions Add-on. 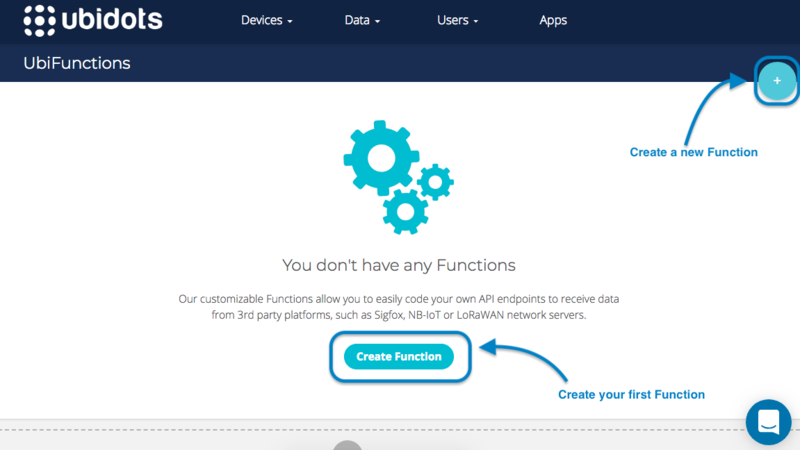 To create a serverless function to parse data from Sensoterra to Ubidots you need to have an active Ubidots subscription. Go to the "Data" tab and select "Function" and create a new function. NOTE: if your account does not have ‘Time based trigger’ as the image below, please contact support@ubidots.com, Ubidots support team to enable this feature in your account. This trigger feature will run the function automatically every X minutes to retrieve latest data from Sensoterra’s servers through the API. A main function that manage the other 4 functions which handle authentication with Sensoterra, the get of the API Key, the get of the available Soil Moisture probes, and builds a JSON payload suitable with Ubidots REST API. 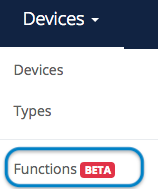 Then the functions completes by making a POST request to Ubidots, updating any device or variable information in the process. Also, main will also parse the data coming from Sensoterra list of available probes to be understood by Ubidots. A getApiKey function: authenticates with Sensoterra’s API using the account credential and retrieves and API Key valid for 30 minutes. A getProbes function that uses the above Sensoterra’s API Key to retrieve a list of the available Soil Moisture probes within the account. A buildJson function which structures the data parsed in main function according to Ubidots REST API. A ubidotsPost function, which uses the specified TOKEN, device_label and a JSON payload as an input to make an HTTP POST request to Ubidots' API. Using the above logic, we obtain the ability to retrieve soil moisture data from a Sensoterra account with registered probes, parse the retrieved data, and then post said data to Ubidots. var apiKey = response['api_key']; // Get API key from response. Note: remember that with Ubidots, whenever a new device label is identified a new device will be automatically created. Want to share a helpful UbiFunction to teach others how to connect the dots? Feel free to post it at community.ubidots.com and help another IoT innovator achieve their goals.